Audiences often ask me what it is we should be doing policy-wise to offset wage stagnation, inequality, working poverty. There’s no silver bullet, of course, but one under-appreciated part of the solution, particularly for those in low-paid jobs, is improving, expanding, and enforcing labor standards. By labor standards, I mean things like minimum wages, overtime pay, safety at work, misclassifying regular workers as independent contractors, and the prosecution of “wage theft” (when employers don’t pay workers), as generally laid out in the Fair Labor Standards Act (FLSA). Although the regulations governing exemptions have been substantially unchanged since they were promulgated in 1975, the in-home care industry has undergone a dramatic transformation. There has been a growing demand for long-term in-home care, and as a result the in-home care services industry has grown substantially. However, the earnings of in-home care employees remain among the lowest in the service industry, impeding efforts to improve both jobs and care. Moreover, the workers that are employed by in-home care staffing agencies are not the workers that Congress envisioned when it enacted the companionship exemption (i.e., neighbors performing elder sitting), but instead are professional caregivers entitled to FLSA protections. 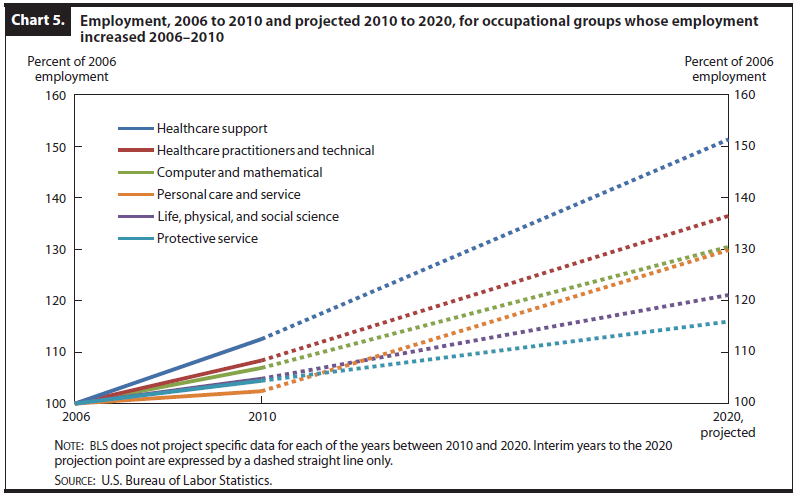 This change is important because health support occupations in general and home health aides in particular are among the top few occupations expected to add the most jobs in coming years. Here’s an area where we can count on creating a lot of jobs, and jobs for people who don’t need advanced degrees (although as I’ve constantly stressed, a home health aide with at least a few years of training beyond high school is much better situated than one without any higher ed). • The median hourly wage for home care workers in 2010 was $9.40. Adjusted for inflation, home care workers earn less today than they did a decade ago. • Approximately 50 percent of home care workers rely on some form of public assistance to supplement their low wages. • In the private pay market, agencies charge consumers approximately twice the hourly rate paid to caregivers. • Artificially low wages resulting in part from the companionship exemption are underwriting the 30 to 40 percent profit margins of the for-profit franchises deliver­ing personal care services. Given those last two bullets, and assuming a competitive market (there actually exists a robust market of third party home health aide providers), I suspect the cost of the new rules will be offset by lower profit margins. In economese, enforcing labor standards in this sector will redistribute the “rents” now being claimed by the agencies to a group of workers with uniquely low bargaining power. And in a growing occupation sector fueled by ongoing demographic trends, that’s a good thing. Share the post "Home Health Aides and Labor Standards"
6 comments in reply to "Home Health Aides and Labor Standards"
For those of us who actually know something about the day-to-day details of home care, it is more likely the patients will get less service hours. The business is more complicated and risky than it looks at first glance. Jared, you are my favorite left-of-center economist (I wish you had gotten Summers job in 2009) but like most economists you probably have little experience in the “real world,” yet write as on expert on home care issues because you read about it. As someone who has experience at least with nursing assistants, and familial experience with in-home aides, I can predict confidently that: 1) absolutely nothing will be done for them gratis; and 2) the only way they’ll find economic justice is by fighting for it through labor organizing and collective bargaining, period. These folks are the perfect target population for unionization today, and the only question is how much and how strongly the power fights to keep its foot on their neck. I’ve worked as a home health aide and I can tell you the agencies will work you to death, they promise the families more duties than the aide can do in a shift, pay them next to nothing, and pocket profits from medicaid and medicare. They would never let HHA unionize because they could not get away with what they do, low pay, not enough hours, do not pay for transportation, do not have to pay for health insurance as they keep the workers below 35 hours by keeping a lot on staff. I got out of it after three years because I wasn’t paid enough to live and if you do get a decent case, after it ends they don’t rush to find you another one. I feel that the agencies have to go. I feel that Medicaid and Medicare should manage state and federal funded home care because there is so much abuse, agencies not paying workers a living wage, no overtime, no health ins. and week out people that receive free care that are not entitled. Oh yes, they exist, I’ve worked for some where their children drive expensive cars , live large yet their parents get free help, meals on wheels, one home that I worked, the people routinely threw out the free meals because they were told, if they stopped, they wouldn’t get it again. What a crime, there are poor people that need it. As an Administrator in Home Health for over 9yrs now I can tell you this “wonderful change” to increase the paycheck of home health aides will actually result in less hours. Let’s say “Nancy” works 48hours a week. She is used to getting $380.00 NET a week. But, since anything over 40 hours is now considered overtime and to be paid at 1.5 times then the agency has no choice but, to restrict “Nancy” to 40hours or less to be sure NO overtime occurs. Why?? the agency is cheap? The agency is against the aides? NO to both. We would love our aides to make more but the simple truth is we get 14.00 an hour and pay 10.00 plus employer taxes and all administrative costs, rent, paper, phones, computers, software, it just goes on and on and the Medicaid and Medicare programs will NOT recognize our overtime issues just like Holiday pay has been an issue forever. No kind sirs your thoughts are in the right place but, you will ultimately LIMIT what “Nancy” can make. You will be directly responsible for causing her to have $40.00 LESS a week and let’s face it……NO ONE can spare over $150.00 a month gone when you are already living paycheck to paycheck. The REAL fix???? Increase the amount of money the provider is paid so we CAN give raises and offer overtime WITHOUT going in the RED.